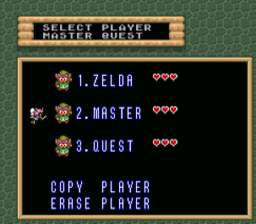 I took the concept behind Ocarina of Time Master Quest and came up with this version of Link to the Past- Master Quest! The dungeons are now harder. Bosses are also harder. As far as I’m concerned, only two holes lead you to debug rooms, but I’m not fixing those because you have to be brain dead stupid to fall in them. The game is completely playable. One last note: The last release promised that it could be mixed and matched with the “bonuses.” I’m afraid I made an error. 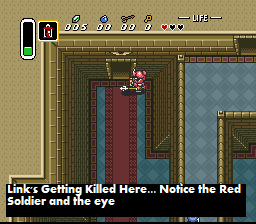 I’ve made versions of the Master Quest patch so you can now, indeed, play as OoT’s Link. There’s different versions of it, fixing only hair, hair and tunic, and complete- as well as the untouched version (meaning only Master Quest). 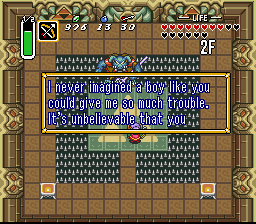 Well, have fun and I hope to enjoy this version of Link to the Past! The compass in the Desert Palace is there now. 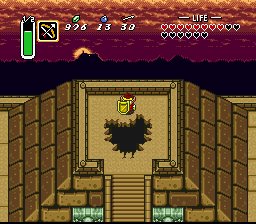 Also, the missing keys in the Forest Dungeon and the Ice Palace are back in there. I played around with some minor things, mainly jokes… cluck? Fixed the Ice Rod Cave and 2nd Light World Dungeon… At least, I’m sure about the Dungeon, not the Ice Rod Cave. I was expecting redone dungeons, like in Nintendo’s Ocarina of Time Master Quest. What I got was mostly the same dungeons, except with some extra obstacles here and there, 98% of which were added spikes and holes in the floor. I think some enemies do a bit more damage too. There are decent amount of graphical glitches as well.